Fhána's major-label debut was with the single "Que sera sera" in 2013. The song was featured as the ending theme of the popular anime "The Eccentric Family". Their second single, "tiny lamp", was featured as the opening theme for "Gingitsune". "Divine Intervention", their third single was the opening theme of the anime series "Witchcraft Works", followed by their 4th single "Itsuka no, Ikutsuka no Kimi to no Sekai", was chosen as the opening theme for the anime series "Bokura Wa Minna Kawaisou". Their brand-new 5th single, "Stardust Interlude" will be featured as the ending theme for the anime series "Sora no Method". fhana's own 1st full-length album "Outside of Melancholy" will be set to release on 4th of February, 2015. 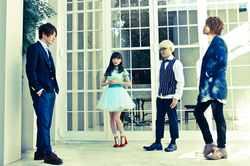 In addition to their own music, fhána has also sound-produced tracks for other artists including ChouCho's "looping star", "life is blue back", and Mai Aizawa's "Sono Setsuna". They have also acted as remixer/arranger for Sayonara Ponytail "Maho no Melody", DECO*27 feat. Hatsune Miku "Nisoku Houkou (Two Breaths Walking)", the TV animation "ROBOTICS:NOTES", and many more.